The Rozsa Center and Department of Visual and Performing Arts presents the Rozsa gallery b show “Come In We’re Open,” an open house exhibition of student sculptors’ works in progress, as a part of the “Project Learning Lab” alternative classroom project. “Project Learning Lab,” a cutting-edge Visual Arts experiment that takes place within the Rozsa gallery. Students in 3D Design and Sculpture will use the Rozsa Gallery as an active and alternative classroom, transforming the space into a real-time work of art during the semester. Student work will be shown twice each semester. A mid-semester showcase will open the gallery for our community to see work in-progress; the end of semester exhibition will welcome community into a fully transformed space. As part of Project Learning Lab, our Visual Arts Faculty are working alongside our students as Resident Art Fellows. “Come In We’re Open” will run from Monday (Feb. 27) to Saturday, March 4. The gallery will host a public reception from 5 to 6:30 p.m. Thursday, March 2. The reception is free and open to the public. Rozsa gallery b is open from 8 a.m. to 8 p.m. Monday through Friday and from 1 p.m. to 8 p.m. Saturday. Visitors may walk through at any time. What is a ChickenBus? 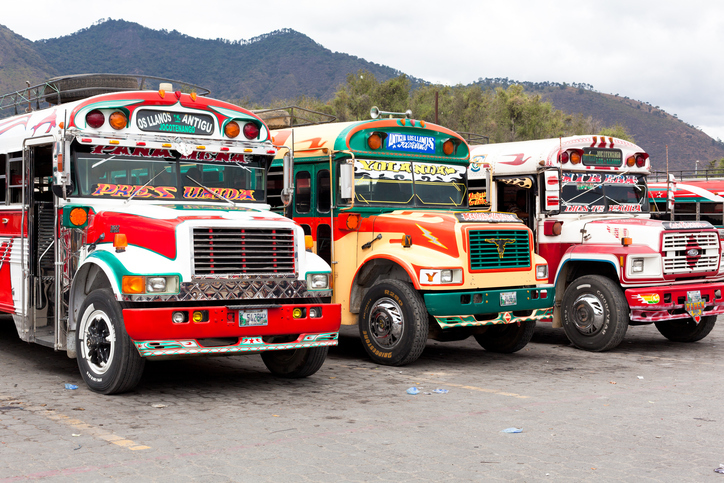 A chicken bus is a bright, loud, jostling work of public transportation in Guatemala. 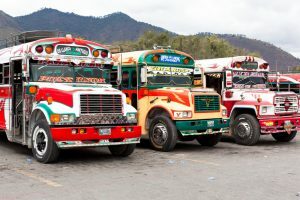 The Rozsa Center and Department of Visual and Performing Arts present the Rozsa Gallery A Space show, “ChickenBus,” featuring work by VPA faculty member Lisa Gordillo. There will be an opening reception from 5:30 to 7 p.m. Saturday (Feb. 25), including a conversation with Gordillo at 6 p.m. 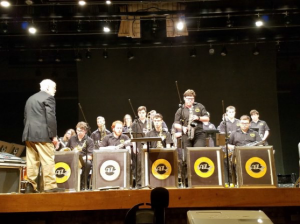 There will also be a second event, a “Marimba Concert and Poetry Night,” developed in collaboration with Michigan Tech music students and conducted by Mike Christiansen (VPA), Michigan Tech’s Director of Bands, at 6 p.m. Thursday, March 24 in the Rozsa lobby. 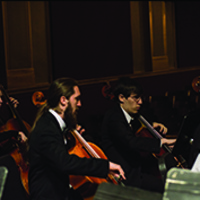 The Rozsa Center welcomes the Keweenaw Symphony Orchestra (KSO) in a special Winter Carnival Matinee concert titled “The Greatest Movie and Video Game Music,” at 2 p.m. Saturday (Feb. 11). The KSO partners with Winter Carnival in a celebration of the greatest movie and video game music. “We wanted to present a pops concert of music that everyone knows and loves,” says KSO Music Director, Joel Neves. “Filmgoers will enjoy the music to ‘The Lord of the Rings,’ ‘Pirates of the Caribbean’ and the original ‘Star Wars’ suite. “Gamers will absolutely love the themes to ‘World of Warcraft,’ ‘Super Mario Bros’ and ‘Bohemian Rhapsody.’ It’s got something for everyone.” The concert is dedicated to the memory of Carrie Fisher, who played Princess Leia in several ‘Star Wars’ films. Fisher died on Dec. 27 at the age of 60. The performance is an official event of the Michigan Tech 2017 Winter Carnival. Tickets are on sale now, $19 for adults, $6 for youth and no charge for Michigan Tech students with the Experience Tech fee. Tickets are available by phone at 7-2073, online, in person at the Central Ticketing Office in the Student Development Complex or at the Rozsa Box Office the afternoon of the performance. Note the Rozsa Box Office only opens two hours prior to performances. 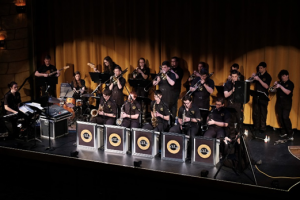 Every January, jazz musicians from the Department of Visual and Performing Arts visit schools around the upper Midwest to carry the word about the importance of music, while at the same time giving many people another important reason to know about Michigan Tech. 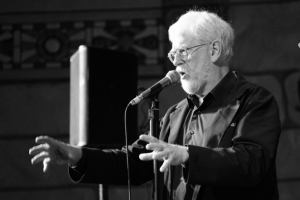 Mike Irish, director of the jazz programs and the key inspiration to the jazz musicians here, has coordinated the January tours for many, many years. This 2017 tour spanned January 3-6 and included concerts at Munising, Newberry, Roscommon, the State Theater in Bay City, Bay City Central and Bay City Western high schools, and Harrison. Just for good measure, the Jaztec group played an evening gig in a restaurant in Bay City. I have had several students ask about the programs that your school has to offer outside of music clubs since this event. The music directors and principals of the schools where our students play often tell me they were blown away by these performances. Predictably, they are impressed by the quality of music from performers not pursuing music degrees. Mike has this special knack for cultivating and guiding student musicians for whom jazz becomes a passion. 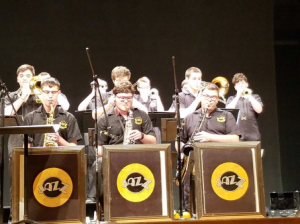 Putting this outcome on display helps the local music educators make the case for the value of music in small and sometimes cash-strapped schools. 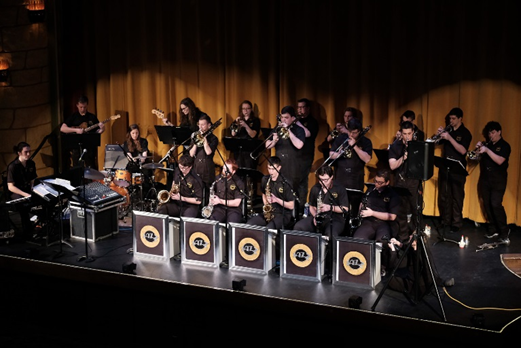 The high school students see the passion and commitment of jazz musicians drawn from every major on Tech’s campus, conveying the powerful message that it is possible to be both a musician AND a great student in the demanding fields of study offered at MTU. Michigan Tech appears in an amazingly good light by showing our commitment to educate the whole person and our effort to integrate all areas of knowledge and learning. For a long time we have known that students are Tech’s best ambassadors, but the jazz players are the best. Their dedication is outstanding, as shown by their schedule on just the first day. They departed the SDC at 6:30AM, played a concert in Munising at 10:00, another at Newberry that afternoon, and then rode the bus south of the bridge to their overnight stay near Roscommon. It certainly helps to be young and energetic! And that energy explains why we these tours will continue. But we should remember that the players gain as much from the visit as their audiences. So we owe the students and Mike a big thanks for their continued excellence and commitment. They represent Michigan Tech and the college very well. Well done! Photos below are courtesy of Michael Robb (Ohno Design in Bay City), father of bass player, Tristan Robb. Jazz lab band at the Historic State Theater in Bay City. Originally constructed in 1908 and remodeled most recently in the early 2000s, the acoustics are exquisite, as the audience of 600 discovered. 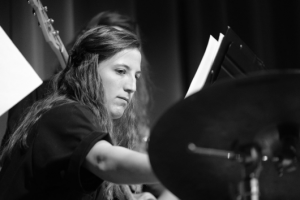 The drummer is Libby Welton, a December 2016 MTU grad in Mechanical Engineering. 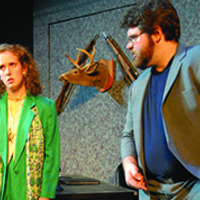 She started her first job in Wausau, WI immediately after the tour was over. Photos from Bay City Public Schools SPOTLIGHT, January 13, 2017.